Judging by the number of people who have downloaded my pattern from the Scribd site, there should be a lot of birds out there. I've been asked a number of times why there's no charge for the pattern and instructions. There are a number of factors to the answer. 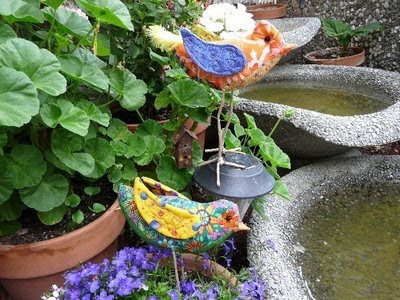 First, the inspiration came from Terry Grant's birds that I saw on her blog (type "birds" in the google search bar at the top of her blog to see her delightful sculptures). Our interpretations are quite different, but still I wouldn't have thought of making that first bird if I hadn't seen hers. Second, I like to share ... I like for others to join in on the fun I'm having. And lastly, I don't like to have to take care of collecting and accounts. Creating, playing, and sharing are primary to me. Here are photos of a few of those many birds. Two of quite a few made by Shelley at Mermaids Purse. Here are individual photos of that pair above. I love her wire feathers and their wrapped legs and feet. Debbie of South Milwaukee sent the photo of this one. I cannot recall, nor find, who sent photos of these two delightful birds. If they're yours, please let me know. 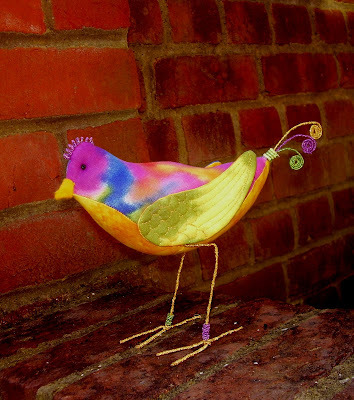 All the birds I've made and those that I've seen made by other people each have their own personality. The fabric choices are a major factor for the differences. However, the placement of the eyes, the amount of stuffing, the length and type of legs and feet, as well the positioning of the body all contribute to each birds unique personality. Check out all the photos that I have of my birds as well as those sent to me. They all make me smile. the bright birds are very uplifing on a cold winter's day! All the birds are delightful and each has it's own character. I love the various embellishments people have added - crests, fancy tails, etc. They really do lift the spirits. Hi Nellie, great minds and all that.............I was just looking at a couple of my birds today and thinking how I could make a few adaptations! Those you how really are bright, cheerful and great fun! I had just been tossing various fabrics around with the thought of finally sewing up one of the bird patterns when I see this blog post! I KNOW i am longing for spring. A bird would be a welcome addition to my studio about now! Your birds are truly joyful and I am tempted to make myself one or two.